Christine lost her 38-year-old sister to suicide. Shannon lost her 21-year-old brother to a drunk driver. Brooke lost her 31-year-old brother to homicide. 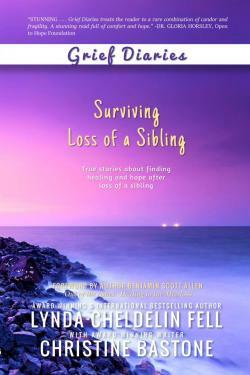 Part of the award-winning Grief Diaries series, Surviving Loss of a Sibling shares the poignant stories of 13 people who have lost a brother or sister. Covering tender issues such as surviving the funeral and transition, navigating the holidays, handling sensitive questions and more, Surviving Loss of a Sibling is a wonderful source of comfort for all who share the journey, and offers a treasured reminder that none of us walk this journey alone. See all books in the award-winning series at GriefDiaries.com.